Sometimes Google does strange things. Hmm. I thought it should be hard to get on the front page of google for such a broad term. Especially, if you do nothing (intentionally, at least) to make it happen. 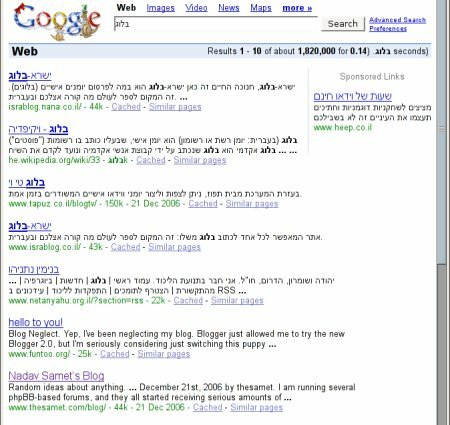 Must do more Hebrew SEO! Read on. If anyone mentions my blog on their blog (in a nice way 🙂 as הבלוג של נדב סמט, I’ll link back to them. My main page has PR4.